The Crow remake, starring Jason Momoa, will officially begin filming this summer in Budapest. In addition to the production start news, character breakdowns have also been released and they feature some obvious differences from the 1994 classic starring Brandon Lee. The Crow is based off Jim O'Barr's graphic novel, and the original movie has become a cult favorite that many believe shouldn't be touched. However, Corin Hardy is set to direct and expectations seem to be pretty high for fans who want to see The Crow get a proper retelling after a series of failed sequels. 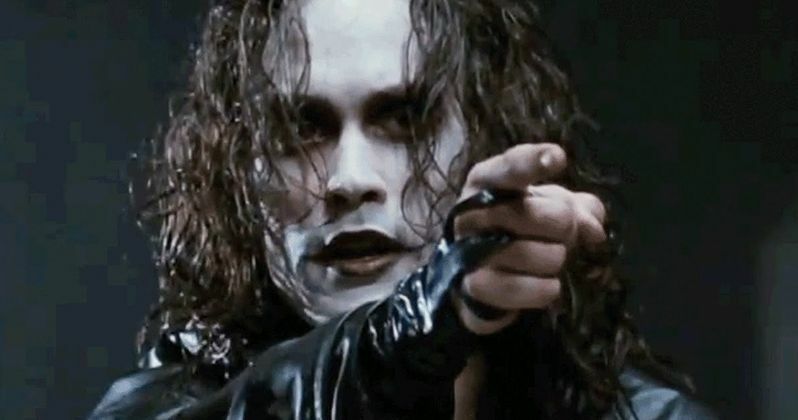 The new casting details for The Crow reboot seem to stick pretty close to the original movie, but there are some pretty big changes that have been made to classic characters. For instance, Albrecht and Top Dollar will both be female in the reboot, as opposed to their make counterparts in the original. In addition, while Top Dollar was the main villain in the first movie, it looks like T-Bird is be the main villain this time around. Finally, there's a new character named Ratso who seems like he'll be a pretty nasty scumbag. T-Bird was played by David Patrick Kelly in the original version of The Crow and was not the main villain. However, the reboot will have a new actor and will be the lead villain this time around. It isn't clear who will play the character just yet, but you can read the details about the T-Bird below. "30, strong and wiry with the cold eyes of a wolf and an endless hunger where his heart should be. Lacking in conscience, covered in prison ink. Has taken over the old Hotel Reno on the outskirts of town where he rolls with Top Dollar and his notorious gang. Tonight, he becomes a made man, but deep down he knows he wants it all..."
As previously mentioned, Top Dollar will be portrayed by a woman in the adapted comic book reboot. The character was the main villain in the original version of the movie but will be T-Bird's girl now. She has been compared to Medusa. The character synopsis reads. "20s - 30s, a lean, reptilian woman who came of age amidst lust and cruelty and has survived by embracing both. She possesses an almost psychic instinct for seeking out a lie, her withering gaze something of a Medusa... T-Bird's girl and co-manager of Hotel Reno, where she has been using her charm to draw in susceptible girls..."
The Detective Albrecht character will also be female in The Crow reboot. Ernie Hudson played Albrecht in the original and was labeled as a sergeant. The rest of the details seem to be pretty close to the original, which you can read below. The Shelly character appears to be pretty much the same in The Crow reboot. She is described as "Eric's one true love. A dancer with effortless talent...Her undeniable beauty is matched only by her passion to teach dance to the inner-city girls at her home studio." The new character Ratso is described as winning the "loser's lottery" and called a "T-Bird wannabe." Tin Tin and Fun Boy round out the character descriptions for The Crow reboot who work for T-Bird and Top Dollar. Fun Boy runs the drug kitchens while Tin Tin has unstoppable fists. You can check out the rest of the character details for The Crow reboot starring Jason Momoa over at Dread Central.